… so you can proceed with caution. Not everything in our lives is meant to happen instantaneously. Some situations take time to cultivate. But in our society we are so trained in instant gratification that when things don’t go according to our plan, we get frustrated and anxious and impatient and try to force situations to come about unnaturally. It is important to note that on our planet everything works on its own timeline and NOTHING can be rushed. The universe maintains perfect time management in terms of bringing you the situations you need, exactly when you need them. There is no room for negotiation here. As we know, things happen for a reason and they happen when they are supposed to. 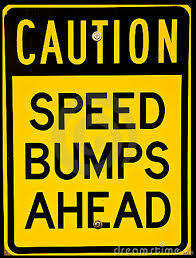 So, why is it that we encounter speed bumps in our lives? Why doesn’t everything happen when we want it to? The answer is easy. When you hit a speed bump, it is an enforced period of reflection & analyses where you are being asked to proceed forward with caution. In essence, you are being held back from what you think you want/need and are being asked to evaluate the situation and your role within it. Are you sure you are ready to go there? Do you have all the tools you need in place to manage that next step? Is this opportunity truly going to meet your needs? Have you considered other possibilities? These are all reasons why we hit speed bumps – it is a built-in process to protect us from jumping into situations that might NOT be right for us. The road ahead is always uncertain, but you can be certain that when you hit a speed bump, you are being asked to slow down and process the direction you are heading. If the path ahead was clear for you, you wouldn’t hit a speed bump. Heed the warning and use the time to evaluate what’s ahead of you. You might decide you don’t even want to be on that road. Speed bumps are the disruptions that bring ultimate clarity.